iOS devices are great at doing many things and one of the things they excel at most is gaming. Over the past few years we have seen tons of awesome games hitting the App Store that have changed the mobile gaming forever. Gaming on iPhone, iPad or iPod touch is not limited to any particular genre as almost all types of titles are available for the iOS platform. In this review today we are going to share with you one of the latest arcade games that we got hooked. 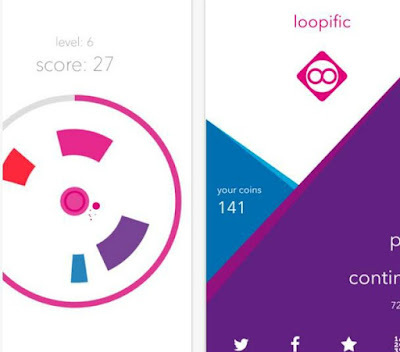 The name of the game is loopific, brought to us by the developer Ludovic Chenneberg. It is a unique and challenging gaming experience that never ends. We loved its whole concept – the beautiful colors and the easy user interface. All you have to do is download it from the App Store and shoot the matching color with the tip of your finger. You will be facing multiple obstacles on your way while everything is spinning, which will test your reflex and timing skills. You have to get from the bigger circle to the center only by touching same colors, so try to get as many times as you can in order to get higher points. If you lose – don’t worry. Press restart and play all over again, try to beat your highest score and make your strategic plans for shooting. With easy controls and highly addictive gameplay, loopific awaits you for free on the App Store.